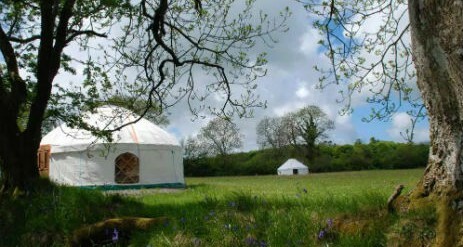 The Yurt Farm is a small eco friendly glamping site on our organic family farm in West Wales. 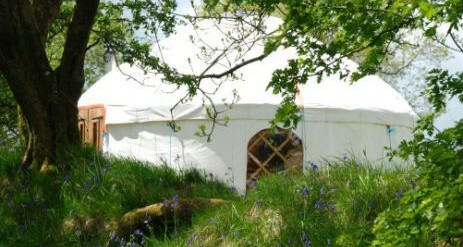 We have four handcrafted yurts and a beautiful train carriage in a wildflower meadow for you to stay in. 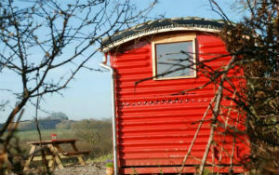 The yurts and the train carriage spread out over 5 acres, each with it’s own secluded campfire and picnic area. Fire up the pizza oven for an evening feast with friends. Help yourself to wood for crackling campfires under clear night skies or to keep your stove roaring. 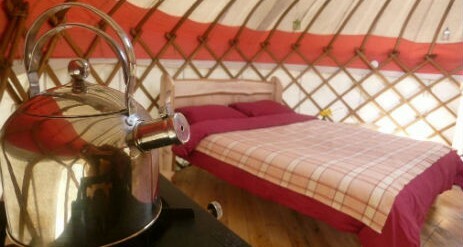 We provide everything needed to make your yurt holiday comfortable and enjoyable. Nearby watch dolphins in Cardigan Bay, cycle country lanes and walk in the Cambrian Mountains. On the farm meet the animals, taste really fresh vegetables from our shop and collect eggs for breakfast. Choose from two 18 foot Yurts sleeping 1 to 5, an 18 foot Yurt & Mini Yurt sleeping 1 to 6 (perfect if you need more private space) or a 21 foot Yurt sleeping 1 to 6 people. 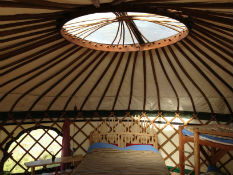 Our oak framed yurts are warm, spacious and light with wooden floors. Laurie and Thea have handcrafted everything themselves using timber from the farm. Inside you will find everything you need for your stay and a well equipped kitchen area. Listen to your wood-burner crackling as you snuggle down into your unique king-sized bed. Wake up to unspoilt mountain views and breakfast around your campfire. The Train Carriage sleeps up to 2 adults and 2 children, a beautiful little hideaway, with amazing views over the Cambrian Mountains. Perfect for couples and small families. 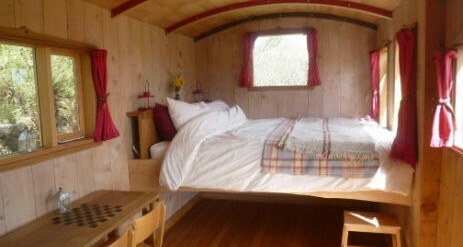 Built entirely by ourselves from local timber, it has a king-sized bed with a luxurious organic mattress made by Abaca. A Devonshire made wood-burning stove and sheep’s wool insulation will keep you cozy. 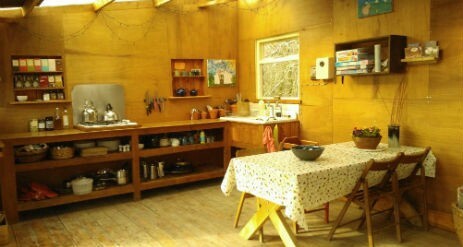 Inside there is a small kitchen with table and chairs. Sit around the campfire in this little sun-trap as bees and butterflies enjoy the sedum roof. ON ARRIVAL IN BOTH YURTS AND TRAIN CARRIAGE you will find…. 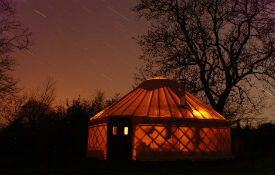 The Yurt Farm is in a secluded meadow surrounded by woods and pasture. 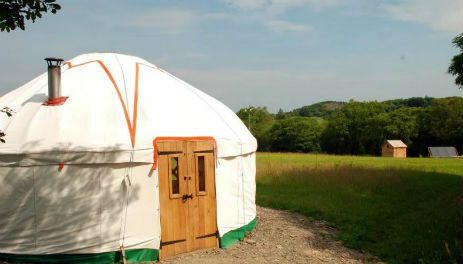 Load up your wheelbarrow and wander over to find your yurt or train carriage. Pick your breakfast from the fruit bushes, collect eggs and give the pigs a scratch. Children play safely in the yurt meadow, on the rope swing, in the sand, making dens and running wild. All the cooking equipment including cutlery, crockery, knives, glasses, cups. tin opener, bottle opener and more. Two solar showers provide lots of hot water and on cloudy days and we have gas to keep the temperature topped up. 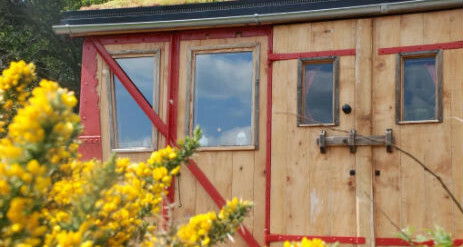 Our composting toilets are in a timber-framed hut built using green oak from our farm. They are probably the most beautiful toilets you’ll find! Crynfryn has been our family’s organic farm for four generations. It is also home to a herd of pedigree Hereford cattle, 60 sheep, rare breed pigs, 400 hens, goats and donkeys. Alongside the animals we grow 4 acres of tasty organic vegetables. You will be given a basket of delicious farm produce on arrival. Everything produced on the farm is for sale at the farm shop and tastes great cooked fresh over the camp-fire. The farm is 150 acres with footpaths and farm trails through pasture, woodland and bluebells by the stream. Remember that Crynfryn is a working farm so please take extra care.